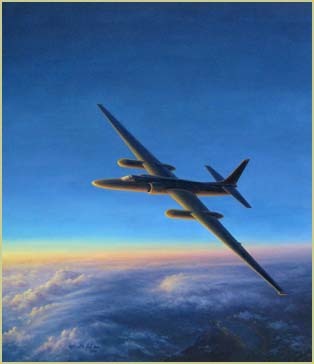 Oil on Canvas 32" x 36"
Kristin Hill flew in the U-2 above 70,000 feet to observe the aircraft and its high altitude environment. Following the flight in the two seat training version and additional research, she created the painting Pacing the Terminator for the U. S. Air Force. The painting is part of the 55th anniversary recognition of the U-2 aircraft and support community's continuing active service. “As the heavy canopy was lowered over my helmeted head and I forced the red canopy latch handle into lock position, artist JMW Turner passed fleetingly through my mind. A century and a half earlier, the British painter seized the opportunity to stay above deck on a sailing vessel and observe with his own eyes and being the harsh stormy elements seasoned sailors knew too well. It was now my time to go where the Dragon Lady roams...” read the full article here. 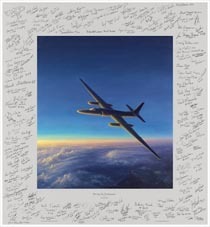 More than 135 U-2 Pilots and 25 Mission Planners signed two Pacing the Terminator U-2 Dragon Lady prints at the U-2 55th Anniversary Reunion. This richly personal recognition of more than five decades of U-2 history includes pilots with solo numbers ranging from 55 to 884. Reproduction giclée prints of the pilot-signed print are available in an artist-signed limited addition of 300 which shows the reproduced U-2 pilot signatures and solo numbers surrounding the image. A plain border print is also available.